The regulars of the Plough pub in Sipson may be facing the bulldozers to make way for a third runway, but one group that will be cheering today is the lawyers. Not only is the Mayor of London, Boris Johnson, planning to take the government to court over the decision to build a third runway at Heathrow. A coalition of local authorities in west London is also planning to do the same, not to mention sundry environmental groups threatening judicial review as well. So despite ministers supporting a third runway in principle since the 2003 aviation white paper, this is really only the beginning of what could be a long and protracted fight. The government has, of course, not just the airlines on its side, but most of the business community, and, significantly, a number of trade unions which understandably welcome the promised 8,000 new jobs at Heathrow and 60,000 jobs in the construction industry to build the new runway and terminal. But the opponents are equally impressive. Firstly, both main opposition parties have vowed to fight the plan "every step of the way". Secondly, more than 50 Labour MPs have voiced concern about the third runway, and may well be tempted to go through the opposition lobbies, if a vote could be engineered in Parliament. And thirdly, environmental groups like Plane Stupid have shown themselves adept at campaigning, and will no doubt be considering further direct action in support of their view. As things stand, the government is resisting calls for a parliamentary vote, arguing that there is a long-standing convention that Parliament does not vote on planning issues. But if both the Conservatives and the Liberal Democrats wanted it, they could unquestionably bring about such a vote. And the Lib Dems have said they will try and do this before the end of the month. Gordon Brown's working majority is currently 63, which means any vote is getting very tight once more than 30 Labour MPs start threatening to rebel. So with significantly more than that already lining up to oppose the plan, government whips will be feeling very nervous. 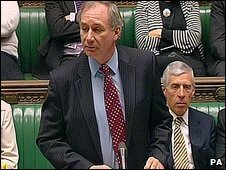 And were MPs to pass such a motion condemning the third runway, ministers would be put in an extremely awkward position. They would either face the possibility of a climbdown on the one hand, or, on the other, having to find a way of effectively ignoring the will of the Commons by washing their hands of the matter and saying that it was down to the new Independent Planning Commission to give the final go-ahead. There's no doubt that the government has tried to sweeten the pill by promising a new environmental target for aviation and by curbing the numbers of flights on the new runway to just over half what it could accommodate. Indeed, a source close to the Energy and Climate Change Secretary, Ed Miliband, rang your correspondent this morning, claiming that the environmental constraints in place meant that it was really only half a runway that was going to be built. But the problem is that few on the opposite side of the argument believe that such a restriction on flights would last. After all, they say, airport operator BAA originally told residents in the area that if they got a fifth terminal, then there would be no need for a third runway. If nothing else, then this whole argument demonstrates that the aims of public policy can, at times, clash head-on. Every political party is signed up to reducing carbon emissions and cleaning up the environment; but every party is also wedded to economic expansion and increasing employment. Squaring that circle is often an impossible task. 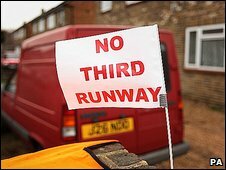 Legal moves aside, perhaps the best hope for the anti-runway campaigners is a Conservative government. The Tories have pledged to scrap the plan if elected next time round. Not all that much comfort for that handful of Labour MPs who believe today's decision will cost them their seats.